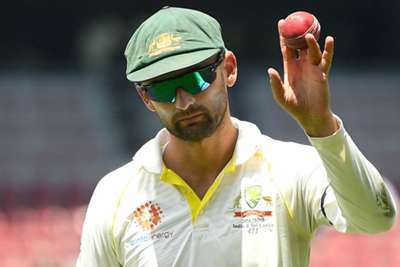 Australia still believe they have a "massive sniff" of winning the first Test against India despite a difficult fourth day in Adelaide, according to Nathan Lyon. The hosts slipped to 104-4 at the close of play on Sunday in pursuit of a tough target of 323, leaving them facing an uphill task to secure the series opener. Shaun Marsh was unbeaten on 31 and Travis Head was 11 not out after Lyon helped bowl Australia back into the match, taking 6-122 to restrict India's lead as the tourists lost their last five wickets for 25 runs. The off-spinner has revealed how captain Tim Paine called on his players to rekindle the spirit they showed in their run chase against Pakistan in October, when they survived for nearly 140 overs to secure a draw against the odds. "Tim was just saying that we've had that belief before when our backs have been against the wall," Lyon said. "We've got a massive sniff here, I believe. We still believe we can win this. "It's about coming out [on Monday] and winning the first ball, the first over, the first hour and just breaking it down. Cricket's a very simple game and we just need to not complicate things and enjoy ourselves." Entry to day five will be by gold coin donation to Lord’s Taverners Australia and Cricket Australia’s Sporting Chance Fund with play to commence at 10:00am local time. Lyon is hopeful South Australia skipper Head can seize the chance to "make a hero of himself" on his home ground, particularly as the pitch is no longer offering as much assistance to the seam bowlers. "There's a chance for Travis Head to come out and make a hero of himself on his home ground," Lyon said. "Everyone knows that I'm close with Travis and I'm a big fan of him." On the state of the surface, he added: "I think the pitch has quickened up a little bit and is doing a lot less for the seamers. "It's definitely spinning, and they've got a world-class spinner, so it's going to be a great challenge for two left-handers, with Ravi [Ravichandran Ashwin] spinning it away. "But the wicket's good enough for us to really knuckle down and have the belief we can score these runs."